Tony Hoare has harboured dreams of being a wheel-sliding oval race hero since he was about three years old. 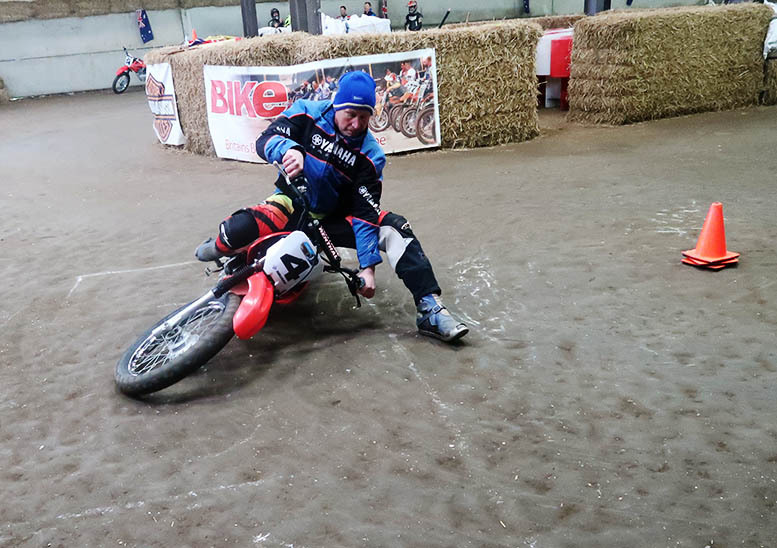 We sent him to Champions Flat Track School to see if they could help him finally scratch that 42-year-old itch. 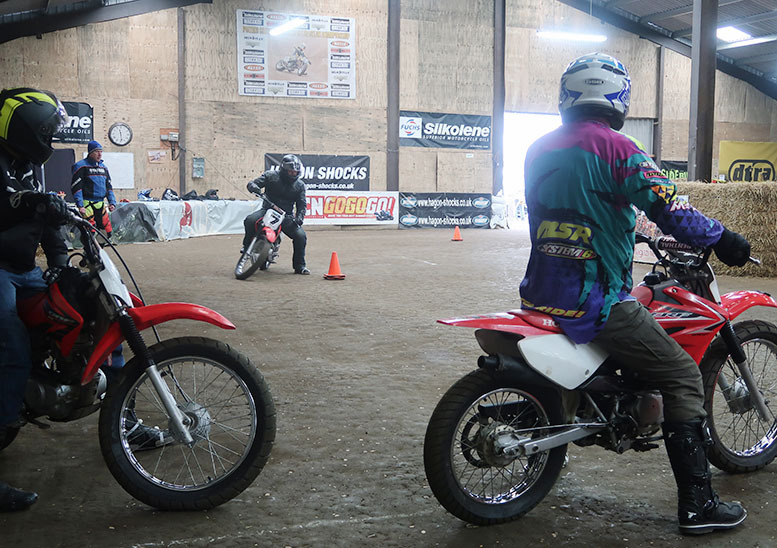 It’s the place to go if you want to learn the art of America’s most popular bike sport – flat tracking. You know, the one made famous in 1970s biker film On Any Sunday? It’s about riding around with a steel-coated boot sliding on the ground as you try and summon the skill and courage to steer the bike with the rear wheel. Anyone who doesn’t think it’d cool as hell to be able to rear-wheel-steer a motorcycle needs to check their biking heart is still beating. And this is the place to make it happen. 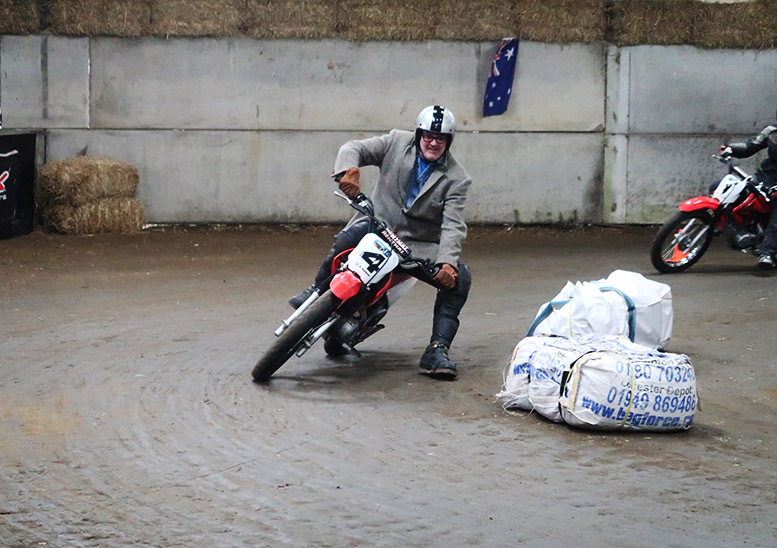 Pete ‘Boastie’ Boast can surely make a case for being one of Britain’s most enthusiastic and versatile motorcyclists. 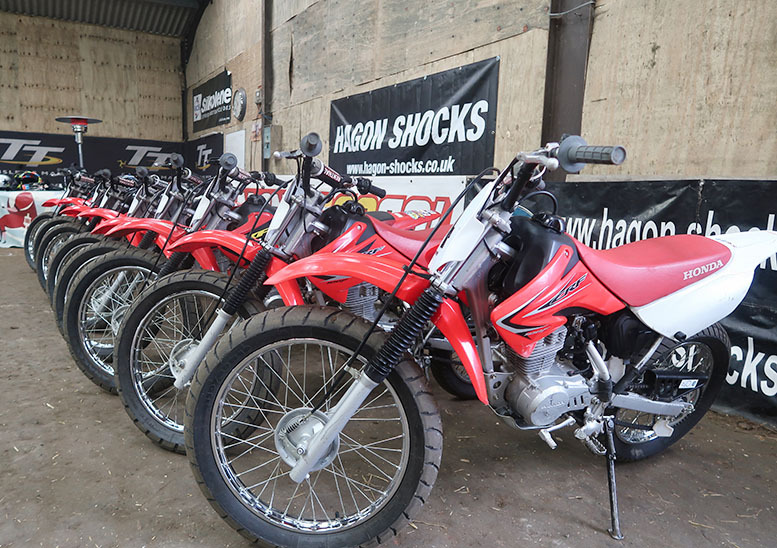 Road racing, enduro, trials, speedway and flat track − he’s done them all, and to a high standard. 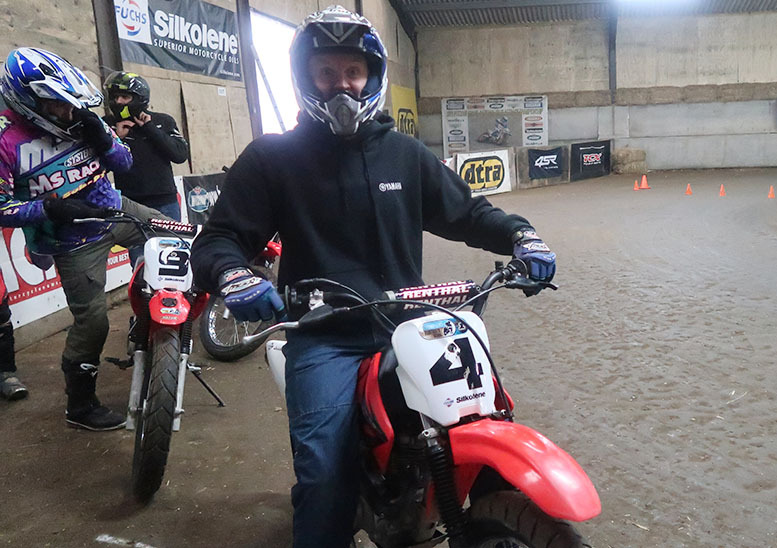 He runs the school inside a mate’s barn somewhere in the Lincolnshire countryside and has developed a neat balance of teaching the basics while letting pupils just have a bloody good time riding the supplied Honda CRF100 bikes around a variety of circuit layouts. 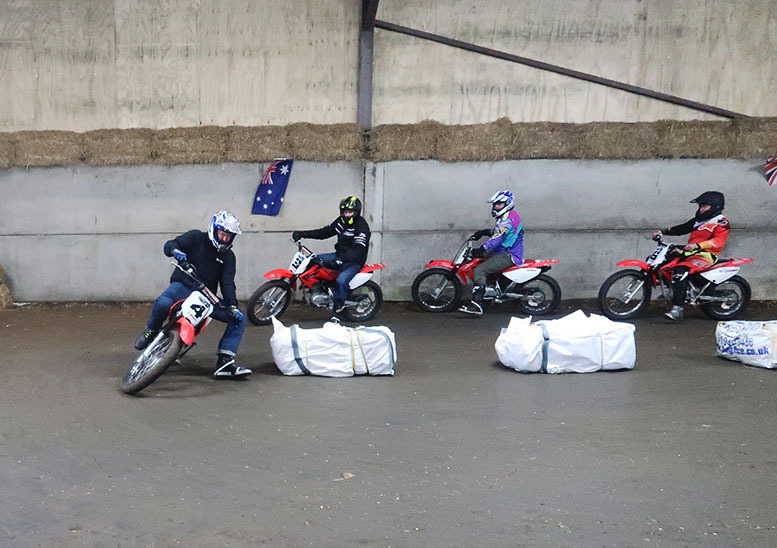 Courses run throughout the year, with the indoor location making the school immune to the pesky British weather that used to spoil things when it was run exclusively on the adjacent outdoor track. The impromptu winners' ‘trophy’ on our day was a bag of Aldi biscuits! 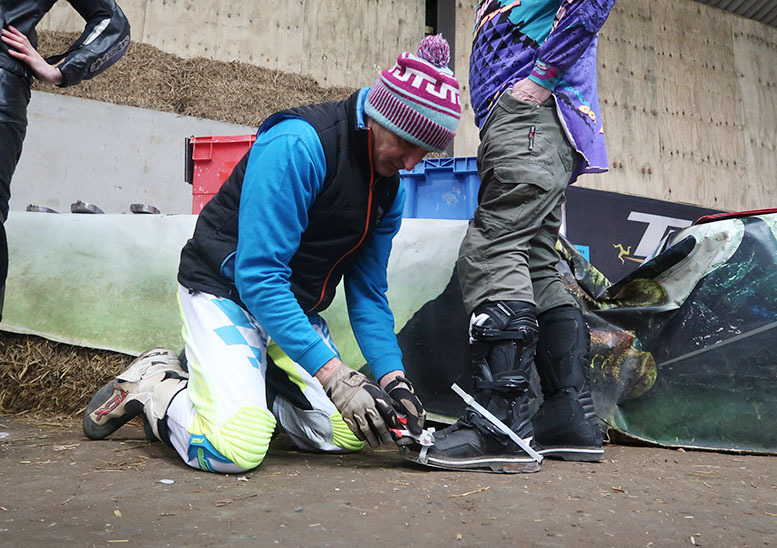 It’s £159 for the day, which includes use of the CRF100s and supply of a steel shoe that fits over any type of riding boot. 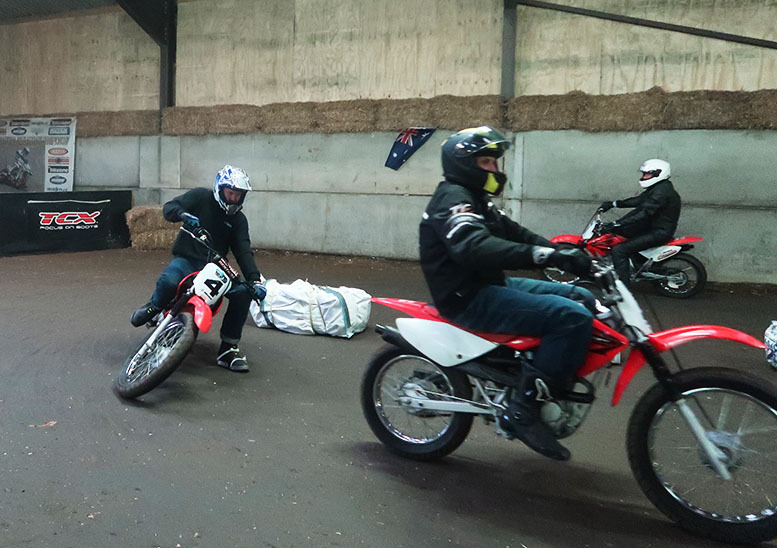 You bring the rest of the riding kit, which can be road riding gear, motocross kit or leathers. You also get lunch in a local boozer thrown in, and drinks and nibbles during the day. 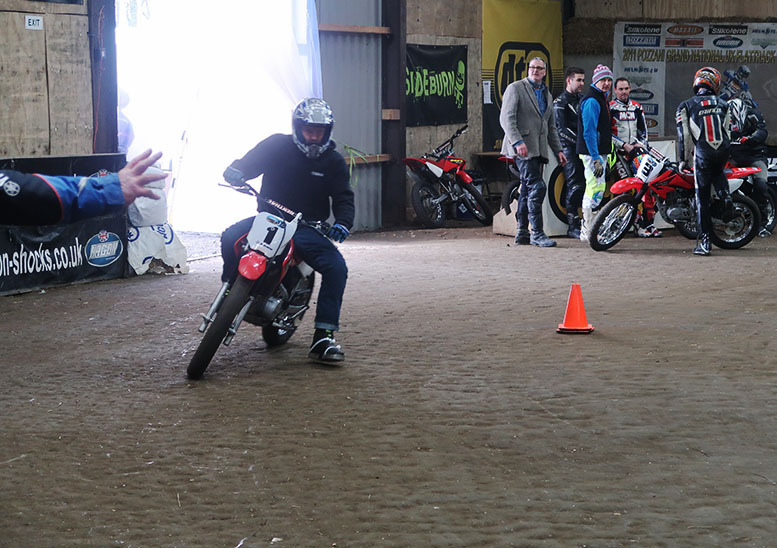 It started with instructor Geoff running us through drills to instill the basics into us, including how to sit on the bike (forward stance, elbows up), and how to hold the throttle for the best response. By lunchtime we were riding around the oval, honing our new-found techniques and developing new ones as Boastie and Geoff changed the circuit layout to get us practising new skills. At the end of the day it’s The Chase*, designed to release the competitive spirit. Pupils are matched into pairs and two pairs go off at the same time, starting from opposite sides of the track (like cycling’s pursuit races). First rider to overtake someone from the opposing pair wins the duel for their own pair, who progress to the next round. By the end there’s a winner and perhaps an impromptu ‘trophy’ – on our day it was a bumper bag of Aldi’s finest cinnamon biscuits. 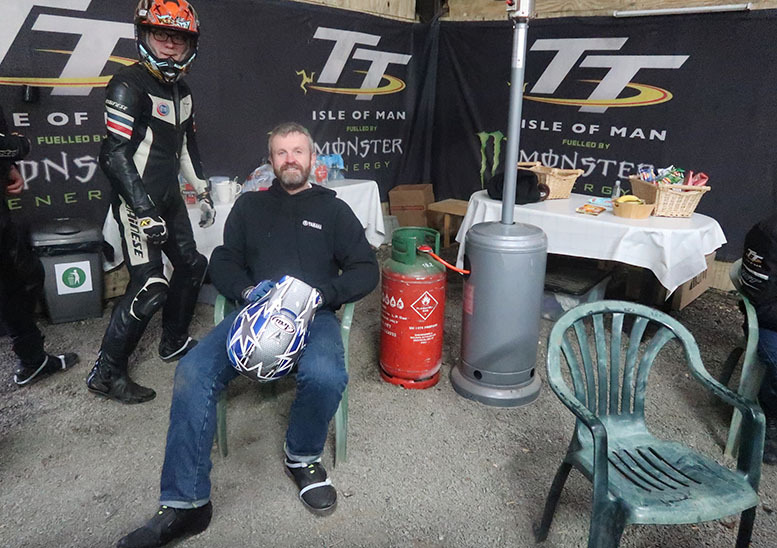 Finally it’s time to head off and nurse a left leg that’s thoroughly massacred from supporting its own weight for lap after lap of flat tracking fun. That’s your next three days sorted. Bloody hell yes. The school has mastered the art of learning through play and passed on the advice I needed to thoroughly enjoy myself, without once feeling I was disappointing anyone by being a bit crap. The pictures are undeniable evidence that the rear wheel didn’t once go into a slide, but it didn’t feel as though that mattered, or that I was a failure. I’ve been on loads of training schools over the years and this one was my favourite. The relaxed approach of Boastie and Geoff, who were there to help but never once made it feel like actually being back at school. I loved The Chase competition at the end, which gave the whole day a bit of edge. I absolutely loved the day. There was quite a mix of abilities in our group, which may have left some of the less experienced riders struggling to find the space on track to work on their technique, but I’d like to think Boastie and Geoff have a plan when there’s a big disparity in rider speeds. That motorcycling is fun and there to be enjoyed. I don’t think many of the skills will relate to the road, but sometimes biking gets a bit too serious for its own good. This is a refreshing break from that. Too right. There’s no licence requirement so anyone who can ride a bike can go and enjoy it. 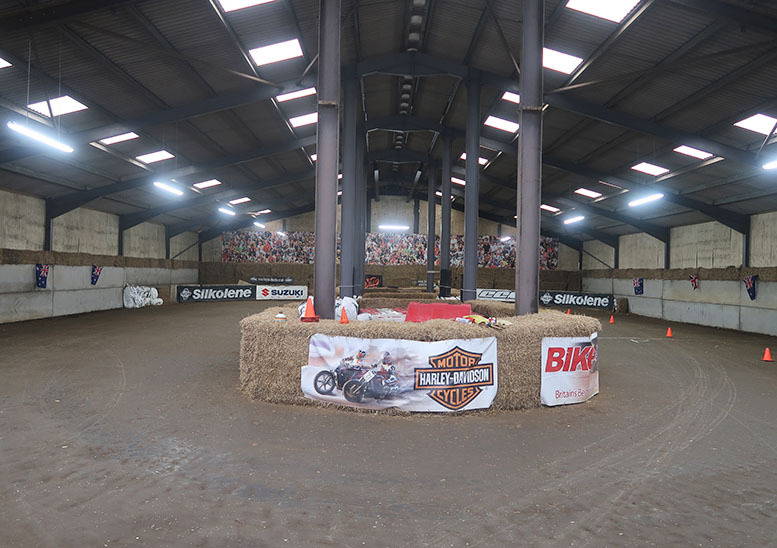 If I could rustle together enough rider mates I’d have a session just for me and my friends (which is something that can be arranged if you’re well-endowed with mates). It’s ideal for anyone who’s looking for something new and is up for a laugh on a bike. It’s not a highly-technical classroom-based school that passes on pseudo-scientific advice, so there’s no need for a notepad and pen (and it’s all the better for that). 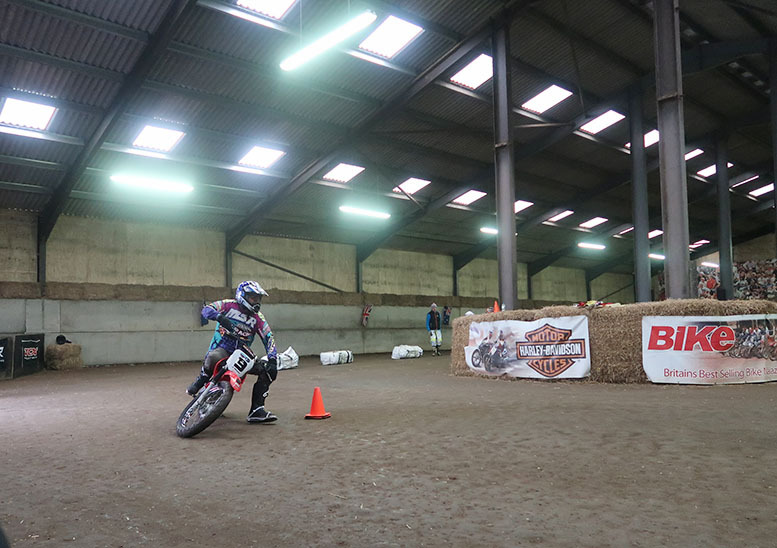 * Champions Flat Track School is 100% free of Bradley Walsh.